On June 12th, Samsung is set to introduce a new line of AMOLED screened slates, the first such tablets from the company since the second half of 2011. 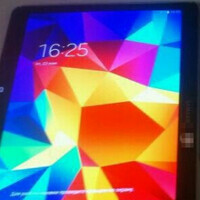 The new Samsung Galaxy Tab S tablets are top-shelf models, with both a 10.5 inch and 8.4 inch variant expected. The slabs are both driven by an octa-core Exynos 5420 processor and include 3GB of RAM. The Samsung Galaxy Tab S slates are also both equipped with an 8MP rear-facing snapper with a 2.1MP camera in front. A fingerprint scanner is embedded in the home button, exactly where it is on the Samsung Galaxy S5. Android 4.4.2 is pre-installed. 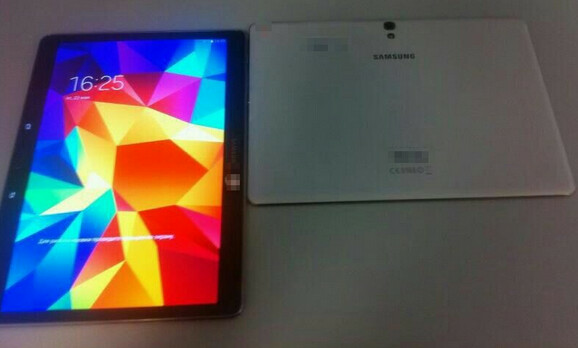 What we have below is an ironic picture of the screen on the 10.5 inch Samsung Galaxy Tab S. What makes it ironic? It is a low resolution photograph of a high resolution screen. And OMG I've been waiting for AMOLED Tabs for the last 3 years! this is stunning. Damn! yes.. that screen has made me crawling out from my cave i tell ya! Oh he used 0.3MP camera. Leakers r great photographer. These leaders, what device to do the use to take pictures. It's like they use phones from a decade a go that had vga cameras. Because most "leaks" are not from genuine "leakers" who would have a much better camera -- or just use the camera on the device they are "leaking". In reality, most "leaks" are just backchannel marketing from the companies that make the devices. It's like raaa-i-aaain, on your wedding day! It's like a freeee riiiide, when you're already late! Hint: There's nothing ironic about a low-resolution image where a high-resolution screen is included in the shot. Can someone explain to me how on earth a low resolution picture can show the details that tell us if the screen has high resolution or not? I don't like it. 16:9 is not a good ratio, they should have made it with 4:3 and a display around 9 inches. I on the other hand LOVE 16:9. I hate watching videos with black bars. I also tend to hold tablets more often in landscape rather than portrait. Physical buttons are great for Android tablets. On screen buttons would use a huge amount of screen real estate.